Summer and her family have been wheaties for generations, workers who travel around during harvest time, cutting, threshing, and storing many farmers’ wheat. Summer, her brother, Jaz, and her faithful dog, Thunder, are living with her Japanese-American grandparents, Obaachan and Jiichan, while her parents are caring for sick relatives in Japan. When harvest time comes, Summer and Jaz set off with their grandparents to travel from state to state, living in campers without air conditioning, bowing to the dictates of the strict supervisor couple, the Parkers, and enduring the scorn of the farmers who do not trust immigrants to work hard enough to get the crop in before the rains come. They persevere through all of this because they must be able to pay the mortgage on their home, and all of their fortunes depend on this one season each year. Although she is only twelve, Summer is no stranger to hard work. She helps her crabby Obaachan to cook for the entire crew, according to Mrs. Parker’s explicit instructions. As Obaachan’s health is deteriorating, Summer ends up doing most of the cooking herself. She also cares for her brother, Jaz, who has been diagnosed with all sorts of disorders from autism to OCD. Her parents have decided not to medicate him, and they all love him even when he drives them nuts. This season, Summer discovers that Robbie Parker has suddenly become a very interesting young man, but she is not sure what Robbie would see in a sweaty, apron-wearing girl like herself. During the previous year, Summer had barely survived a bout with malaria, and she is now terrified of mosquitoes and is continuously slathering on DEET, so much so that she reeks of the odor all the time. However, her brush with death has caused her to think deeply about subjects of which most young adolescents are blissfully unaware. When her Jiichan falls ill, Summer clearly understands that he may not be able to drive a combine any longer, which would mean that they would all be fired and eventually lose their home. As she struggles to deal with these practical matters, she is also frightened about both of her grandparents’ health and realizes that she may soon be taking care of her brother alone, with their parents far away in Japan. Here is an author whose books are almost guaranteed to win awards. 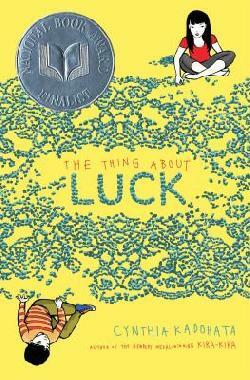 The Thing About Luck is already sporting a “National Book Award finalist” medal, and I would not be surprised to see a Newbery medal on that cover soon. Cynthia Kadohata writes about serious topics that affect children who may be very different from her readers. In the Newbery-winning Kira-Kira, the protagonist is dealing with the loss of a beloved sister. Her parents are Japanese immigrants who work in the harsh conditions of a chicken processing plant in Georgia in the 1950s. In Weedflower, she relates the personal stories of Japanese-Americans in internment camps during World War II. Cracker! : The Best Dog in Vietnam, tells the true, disturbing story about soldier dogs. Kadohata shakes us out of the stereotype that all Asian immigrants are working in tech companies and have math genius kids, or that immigrants who work in chicken factories and fields all speak Spanish. She shows us poor, struggling Asian immigrants who endure grinding manual labor and highlights the lives of the children who are always hidden behind the headlines in the news stories. Lest you think that The Thing About Luck is relentlessly depressing, I can assure you that Kadohata sprinkles her novel with plenty of humor. Summer is, after all, a twelve-year-old girl with her first crush. She practices kissing the back of her hand in her bunk at night, but her grandmother seems to know everything that she is doing, so she ends up embarrassed. Summer and Obaachan’s dialogue is often hilarious, as Obaachan feels that it is her duty to scold Summer about every single detail of her life and ground her so often that Summer would probably be eighty years old before she was free. Summer has a hard time believing her mother who told her that Obaachan slept with Summer every day when she was sick because she loved her so much and couldn’t bear to lose her. Here are some of my favorite bits of Summer and Obaachan’s interchanges. “But you had an arranged marriage,” I once pointed out. “Something happened,” I said [to Obaachan]. “It’s really all my fault. It isn’t Thunder’s fault, and it isn’t Robbie’s fault. It’s all mine, one hundred percent,” I said passionately. This novel is definitely one of my top picks for the year. I am having a hard time deciding between Counting by 7s and The Thing About Luck. It is interesting that they are both about Asian-American girls in such difficult circumstances that they are forced to stretch themselves farther than they thought they could go. Very highly recommend for ages 9 and up. Update on November 21, 2013: I am excited to report that this title won the National Book Award for Young People last night! Richly deserved. Disclaimer: I read a library copy of this book. My opinions are solely my own and do not reflect those of my employer or anyone else.